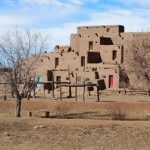 Taos Pueblo is an ancient Native American community that is said to be over 1,000 years old. Originally home to the Taos people of the so-called Pueblo tribes, named by the Spanish conquistadors for their advanced “pueblos” – villages in Spanish. It’s surmised that these natives came from the four corners region, and were originally part of the Anasazi tribe. Today, approximately 1,900 people live on the surrounding reservation, but only about 150 live on site. The reservation owns and restricts the electricity and running water and residents have only outdoor fireplaces used for cooking. So, there’s been a bit almost no updating done other than maintenance in the last 400 years. There are two primary structures of pueblo homes known as the north house (or Hlauuma) and the south house (Hlaukwima), divided by a tiny creek. Large timbers form the roofs and mud and straw the walls of these simple, but strikingly advanced five-story dwellings that are said to have been continually inhabited for at least six and a half centuries. There’s also a church and cemetery on site that date from a much later time period. The San Geronimo church replaced the original mission (from 1619) which was rebuilt in 1847, but soon destroyed in the Mexican War. The current church was completed in about 1850, and served as a stunning subject for the famed photographer Ansel Adams. Several of the homes are now set up as shops for natives to sell their crafts. Many make art pottery from the regional earth called mica clay which shimmers from all the mica in the brown soil. In fact, it’s the same soil used to create the pueblo homes. But it wasn’t just pottery, artisans (some very good) created ornaments, drums, jewelry and paintings. There is one shop featuring outdoor oven creations like Indian fry bread and fruit pie (much thinner than the conventional pie, thus fewer calories and carbs, NICE!). We sampled both the cherry pie, which was amazing and the bread, which, even when smothered in powdered sugar, was pretty bland. Interestingly, the tribal dogs arrive each morning precisely at 8 a.m. and leave each day at 5 p.m. (the open times of the pueblo). Most have homes on the reservation but come to the pueblo for food and attention. It’s as if they had jobs, and I was kinda proud of these little mutts for taking the initiative to not just sit at home and live off their owners, but to find a career they enjoy. We were directed that, if we feed, pet or even look at a dog, their attention never ceases, and it will be ours to take. So, we tried hard to ignore each of them. The cost for entry is $12 each and $6 fee for each camera. The camera fee is unusual but okay. Apparently, there is a custom that, if you photograph a native, you must get consent then also tip the individual, and many of the artists have tip jars out. We know life is hard on the reservation, but if we like your artwork, we’ll give you money… we’re not tipping to see you sit in your chair and ignore us. We enjoyed our walk around the pueblo and bought few small clay pottery pieces but we didn’t learn as much as we wanted as locals didn’t seem to have the answers to our many questions – maybe reenactors would be a better way to go.